The subject piece of Land by Dhekelia is located at the north side of the town and within walking distance to the beach in Palm Beach Hotel Area, Larnaca Bay. Specifically it is just 600 meters away from the Palm Beach Hotel and Beaches. The land has a total area of 10813 square meters. A PLANNING PERMISSION FOR SEPARATION OF THE LAND INTO 8 LARGE PLOTS HAS ALSO BEEN ISSUED IN AUGUST 2017. The Palm Beach area features a strip of hotels, restaurants and other entertaining facilities all by the beach. The land is ideal for the development of a deluxe complex of villas. 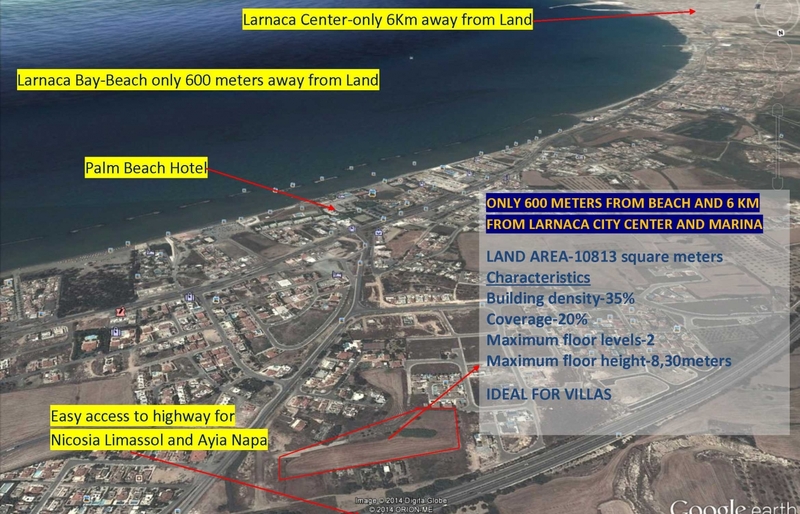 The Land is located in Asprolakkos area in Oroklini Larnaca with easy access of the highway Larnaca – Ayia Napa – Nicosia and just 600 meters away from the Larnaca Tourist Area beach and Palm Beach Hotel. a) Physical characteristics – the land is of total area of 10 813 square meters (Ten Thousand Eight Hundred and Thirteen Square meters). It has a flat surface and is vacant of any buildings or other structures. A very limited number of plots and land is now available in this prime location. The area has been developed during the last 10 years with exclusive villas and restaurants, shops and other complexes. The demand for Land in the area is high however the property market recession combined with the weak Cyprus banking sector which currently do not finance any large land purchases leaded to less transactions within the last year. in this respect the land is a unique opportunity for the serious investor.